The hectic lives we lead today make it difficult to find time to just be together. Get creative with these fun ways to help your family bond. Turn up the tunes and get your groove on! Freestyle with your favorite music, or turn on one of the popular video game dance challenges. You’ll have a great time, and all that laughing will bring you closer together. One more plus: you’ll get fit in the process. Unfortunately, your city is probably filled with people who need your help. Reach out to a group or organization that caters to those in need and lend a helping hand. You’ll all walk away feeling good about your good deed, and probably realizing how good you really have it. A shared experience as meaningful as that is bound to bring you closer. Gardening is a lot of work, but it’s a lot of fun too. Go shopping together and let everyone pick out fruits and vegetables to grow. 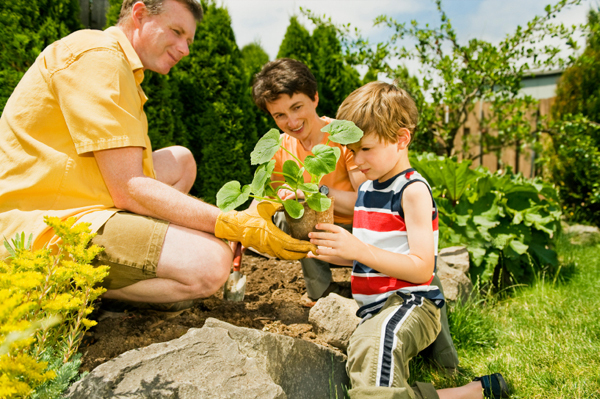 Take turns working the garden or do it all together — older kids can pull weeds, while little ones will love wielding a watering can. You’ll all feel a shared sense of accomplishment when you sit down to a dinner full of food you grew together. A little competition goes a long way toward bringing a family together. Split into groups of two, choose a random food item from your kitchen and give both teams 20 minutes to throw together a meal featuring that item. You’ll have a great time creating together, and then laughing about the process while you eat. You spend enough time getting your kids off to school. Isn’t it about time you go with them? Sign up for a class you can all enjoy together. Try cooking, jewelry making, baking, acting, dancing or sports. To make it fair, let everyone take turns deciding what class you’ll all take. No matter how old your kids are, they wonder what you do while you’re away all day. The idea of your life away from them is foreign and hard to comprehend. Clue them in with a trip to your office. Seeing you at work will show you in a whole new light. Give them a small project to work on for the day. It’ll keep them from getting into trouble and make them feel important. Why save all your best adventures for vacations? Take advantage of the undiscovered places in your own town. Try a new ethnic food or visit that touristy place you always drive by. Trying new things together is a great way to grow closer. No time for extra activities? Try to eat dinner together as much as you can and make sure to keep the conversation flowing!